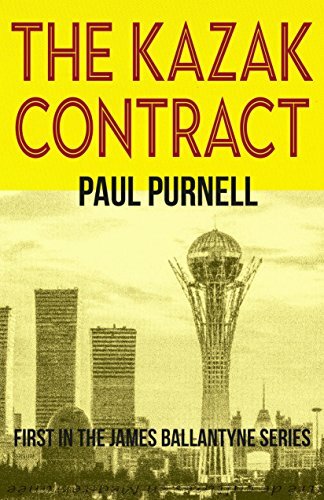 This is the first book in the James Ballantyne series by Paul Purnell, a new author to me. When I first read about this book I was intrigued as I normally enjoy crime thrillers but this is set in Kazakhstan which sort of swung the deal. I am always fascinated by the different way countries are governed and policed and what better way to find out than reading a book by someone that has been personally involved in the criminal justice system. Well if this book is anything to go by it is going to be a pretty awesome series. I thought at first that James Ballantyne was going to be a bit of a wimp but oh boy was I wrong, reluctant hero yes but wimp no. Doing business abroad always brings its problems as what is cosha in one country can be taboo in another, so when James arrives in Kazakhstan, on a minor diplomatic assignment, he is guided through the protocol of doing business with the very beautiful Ocksana Petrova as his aide. It is when he is left to his own devices that things take a dive when he goes to the aide of an American. Here is where the story takes off with trying to work out who can be trusted. Does no one in this country do anything without it involving being bribed? How can you trust anyone that could sell you out to the highest bid? Not only is the American in grave danger now but he has also become a person of interest. It is time to leave but can he trust the glamorous Ocksana that he is falling for or is she simply there to inform the authorities about where he is? Guns at the ready because this isn’t going to be a walk in the park. I really got carried away with this book, I hope that a further book is all lined up for being published in the not too distant future.